It’s freebie time! 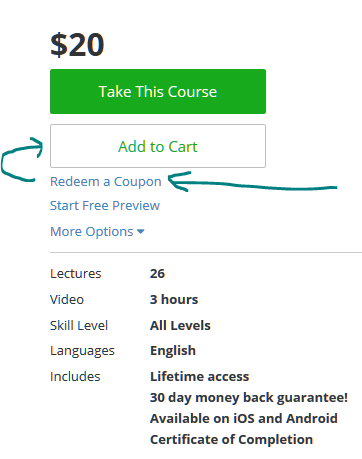 Online course site Udemy is offering, for a limited time, the “Photoshop in Ease: Create World Amazing Graphic Designs” video course for FREE when you enter coupon code MASTERDESIGN over there. The course runs 3 hours long with 26 lectures. It offers lifetime access, and you can watch in a web browser or using their iOS and Android apps. You don’t have to enter a credit card or billing address unless you are going to pay for something.